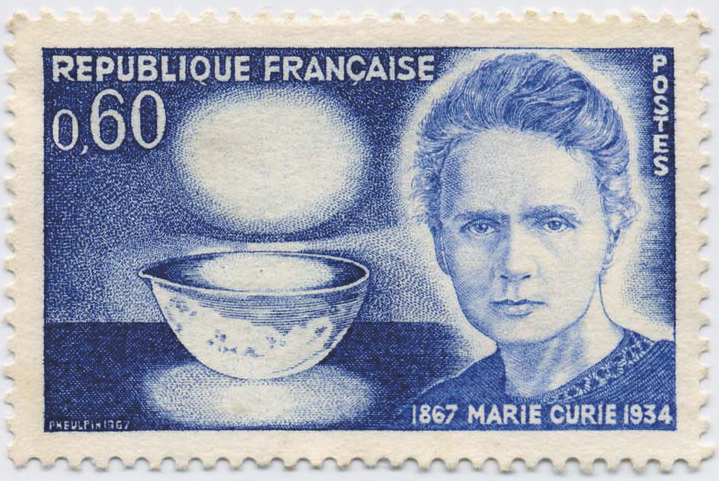 The first person to win a Nobel Prize in two sciences and the first woman to be given the accolade, Marie Curie was clearly a pioneer in her field. She had a tireless dedication and commitment to science and was fascinated by how it could help people. Her role as both a laboratory scientist and an active medical worker on the front line in the World War One showed her passion for her cause. Maria Sklodowska was born on November 7, 1867 in Warsaw, Poland and was the youngest child of teachers Bronislawa and Wladyslaw Sklodowski. Her oldest sister Zofia died when Maria was just ten, followed by the death of her mother from tuberculosis two years later. The birth centenary of Maria was celebrated on stamps issued by France, Monaco and Poland in 1967. 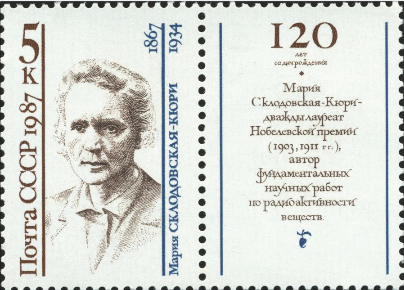 The Polish issue consisted of three stamps depicting Maria's Nobel Prize diploma, a statue of Maria, and her portrait. Romania's issue in 1967, Cultural Anniversaries, celebrated 100 years since her birth with a stamp. In 1891, Maria left her father and Poland behind and travelled to Paris. She registered at the Sorbonne university as Marie, the French version of her name, and within three years had attained a degree in physics and mathematics. Her work in physics earned her a scholarship and the Society for the Encouragement of National Industry paid her to investigate the magnetic properties of different steels. But for this she needed a laboratory, and it was in 1894 she was introduced to Pierre Curie, Laboratory Chief at the Paris Municipal School of Industrial Physics and Chemistry. In 1895 Pierre and Maria married and in 1897 she gave birth to their first daughter Irene. After completing her research, Marie began work which built on French physicist Becquerel's investigations into radioactivity, however it was her discovery of the potential of a new element which led Pierre to join her in her studies. In July 1898, the two scientists published the results of their findings - they had discovered two new radioactive elements; polonium and radium. Their research soon became crucial in the development of x-rays for surgery. In 1938, the 40th anniversary of the discovery of radium was celebrated by France and Monaco with the issue of two stamps featuring the scientists. 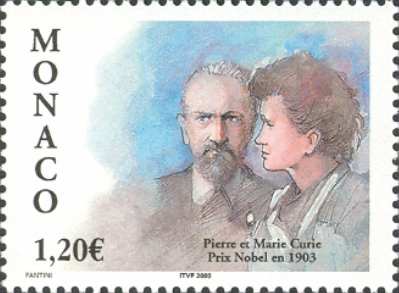 The centenary was also celebrated by France, Portugal, Monaco and Poland in 1998 with stamps featuring Marie and Pierre in their laboratory and scientific instruments. Ireland chose Marie for one of six stamps as part of its New Millennium Discoveries issue in 2001 and in 1996 she featured on one of Moldova's Famous Women stamps. People became fascinated with the discovery and Pierre went on to prove that radium could damage human flesh, paving the way for the treatment of cancer and other illnesses. In 1903 Marie completed her thesis and the Nobel Prize for physics was awarded to Marie, Pierre and Becquerel in the same year. Pierre was appointed to a professorship at the Sorbonne and Marie was given the role of laboratory chief, and in 1904 she gave birth to her second daughter Eve. In 1963 Marie featured on one of three stamps in the Swedish issue Nobel Prize Winners of 1903, and in 2003 Monaco released a stamp celebrating 100 years since Pierre and Marie received the award. In 1906 tragedy struck - Pierre was knocked down by a horse-drawn wagon and killed. Marie, although shocked and grieving, returned to work and took Pierre's position at the Sorbonne. She then established the Radium Institute in Pierre's memory and gained funding from the French government. 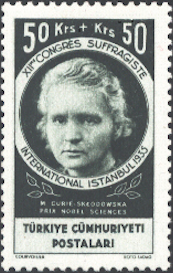 In 1911 she was awarded a Nobel prize for chemistry for her discovery of radium and polonium. In 1971, Sweden depicted Marie on one of the stamps it issued for Nobel Prize Winners 1911. She also featured on Poland's 1982 issue, Polish Nobel Prize Winners. In 1914, with the outbreak of World War One, scientific research was halted. Marie, determined to help, equipped ambulances with x-ray equipment to help doctors determine where shrapnel, bullets and broken bones were in wounded soldiers. With her daughter Irene, she took charge of x-ray stations and also prepared glass tubes of radioactive gas for doctors to use on patients to destroy diseased tissue. After the war Marie returned to the Radium Institute, making it a world-class centre for scientific research. However, from 1920 she began suffering from ill health and on July 4 1934, she died of aplastic anemia, a blood disease that can result from receiving too much radiation. 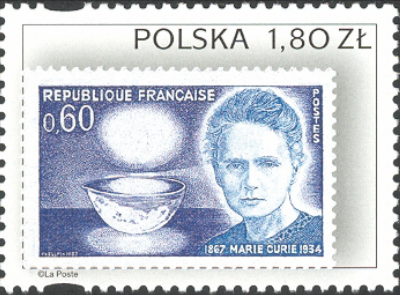 While Marie spent most of her life in France, Poland, her home country, has issued many stamps celebrating her life and work. In 1947 she featured on one of twelve stamps celebrating Polish Culture, in 1951 she was depicted on an issue celebrating the Polish Scientific Congress and in 1955 a statue of Marie features on a stamp in the Warsaw Monuments issue. In 1963 and 1992 she appears as part of the Famous Poles issues and in 2003 she is depicted on an issue which shows designs from other countries' stamps, Polish Influence Abroad, with her stamp being French. In 1982 she was featured in San Marino's Pioneers of Science, and in 2001 in Belgium's Science and Technology issue. 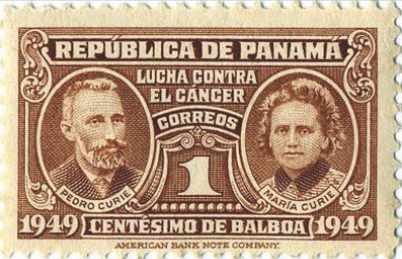 There are many stamps featuring Marie Curie not just in Europe, but worldwide, allowing collectors make their own discoveries in this fascinating area of science which is still very important today.